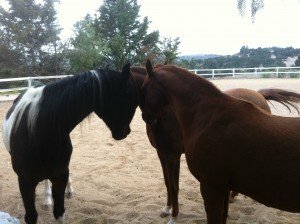 Horse Wisdom for the Soul believes that horses become our Partners in Healing by allowing us to experience the serenity of the present moment and providing for us mirrors of our own emotions, ways of communication, and challenges in relationships. 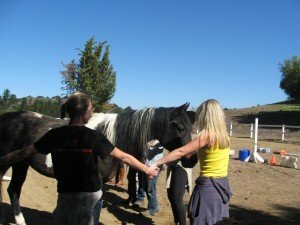 Equine assisted mental health therapy and learning is a unique approach to personal health and growth involving the horse-human relationship. It promotes emotional and psychological exploration, enhanced relationships, mindfulness of the present, improved communication skills, and encourages insight and healing. Horses are flight animals and survive and thrive by keeping a wide view, staying aware of the big picture. Because they are preyed upon in nature they must have a highly developed ability to sense changes in the environment and in the stance and arousal level of other herd members. This gives horses an incredible ability to sense and respond to the slightest signal, change in behavior or emotion in humans. Horses are also social animals, depending upon the interaction and cooperation within the herd. Watching how they interact and communicate with one another can teach people a great deal about nonverbal communication, social interaction and living in the present moment. 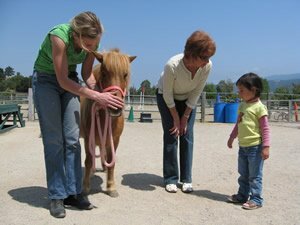 Learning how to communicate with horses offers an opportunity to devlop metaphors and analogies that can be applied to life challenges and skills. Horses are imposing in their size and focus our attention. They may offer some people the opportunity to overcome fear and develop self confidence. Their size and quickness to respond may also help people stay focused in the present, alert and aware in order to stay safe and feel secure. This attentiveness helps to develop skills in improving responses to the changing circumstances of life and empower one to try new things. 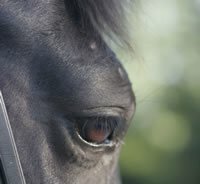 When we interact with horses we begin to see ourselves through their eyes. They provide an authentic mirror, reflecting what we tell them with our bodies. When the horse feels safe in our presence he will become a partner, approaching and joining us in synchrony. They are willing to engage us in a non-judgmental way; yet provide direct feedback to our fears, strengths and authenticity. Horses inspire us to live in harmony, authenticity and connect to our whole beings. This healing capacity of the horse is truly powerful and remarkable. and our connection to something larger than ourselves.